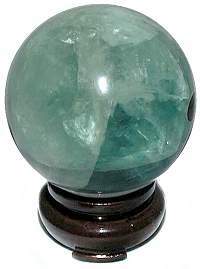 Green Chinese Fluorite 60mm spheres have icy pale green to dark blue green hues with translucent crystal formations. 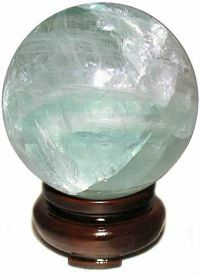 Green Fluorite is reputed to have an especially purifying and revitalizing effect. The Oriental Wood Sphere Stand is sold separately. 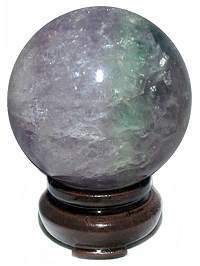 Lovely 60mm or 2 1/2" AA Chinese Rainbow Fluorite Spheres have an eye catching mix of purple, clear and green translucent hues with unique crystal formations. In crystal lore Fluorite brings order to chaos and provides a stabilizing energy which helps relationships and individuals to flourish. The Rosewood Sphere Stand is sold separately. 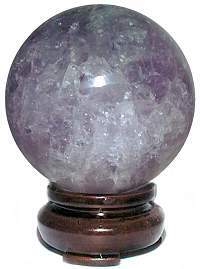 Superb quality extra clear AA Green Fluorite Spheres have excellent clarity and delicate shades of purple and clear Fluorite with lots of rainbow inclusions. 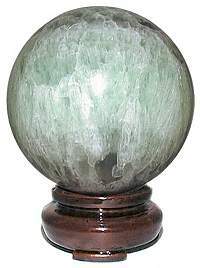 Green Fluorite is reputed to have an especially purifying and revitalizing effect. The Rosewood Sphere Stand is sold separately. Unusual Purple Ice AA Chinese Fluorite 55mm+ Spheres have translucent honeycomb like crystals. Highly polished and good color spheres. Fluorite plucks order from the heart of chaos, it provides a stabilizing energy which helps relationships and individuals to flourish. The Oriental Rosewood Stand is sold separately. Superb Icy green AA 67mm or 2 5/8" Chinese Fluorite Spheres have unusual honeycomb like crystals a zigzag formation with small rings above and below of purple coloring. Fluorite plucks order from the heart of chaos, it provides a stabilizing energy which helps relationships and individuals to flourish. Good polish and finish with no cracks. The Oriental Rosewood Stand is sold separately. 67mm or 2 5/8" Sphere - 1lb 2ozs.